Amtrak’s Coast Starlight, which it bills as “A Grand West Coast Train Adventure,” is its last remaining full-service sleeper train. The Coast Starlight is home to what would have previously been standard: a dining car, an observation car with floor-to ceiling windows, a movie theater, and a full slate of entertainment options, including the two complimentary wine tastings. Nicole Dieker takes the trip. “I feel totally bummed that we aren’t traveling together,” I wrote him. We had been batting around ideas of how, exactly, to get me and my minimal possessions up the coast from Los Angeles to Seattle. I was making the move, but, as Mike noted, it was a team thing – we were both closing the distance on our long-distance relationship, even though only one of us had our stuff in boxes. The trouble was we were both practical enough to want neither the fox, the hen, nor the bag of corn to do too many jumps back and forth. We had finally agreed that the most logical solution was for me to make the move solo – to pack everything up myself, drop it into a moving storage container, and fly up to the Pacific Northwest. That idea did not sit well with either of us. And, that night, we kept coming back to the train. The Coast Starlight would take us from Los Angeles to Seattle in 35 hours, at $763 for a Superliner Roomette. Food and entertainment were included. Free wine and cheese, I kept noting, as if the promise of a few glasses of wine would be enough to offset the cost of the trip. Not that the cost was really the deciding factor. After all, $763 total is really $381.50 per head, about the same as it would cost to either fly or to take a long weekend and drive the Pacific Coast Highway. It was more the thing of the thing, a vague phrase that in this case meant: This trip isn’t about moving. It’s about something else. “We are going to have an adventure,” I wrote. Then I sent Mike a Facebook sticker of a sailor and a mermaid sharing a bottle of Champagne. The start of our adventure. Photo by Michael Bain. There was free Champagne on the trip, but we didn’t know it yet; instead, we were starting our arrival at Los Angeles Union Station with free coffee, in the special lounge set aside for Coast Starlight sleeper car passengers. Neither of us had slept, since he and I had both arrived in Los Angeles barely 24 hours prior (Mike had come down from Vancouver; I had flown back from a series of performances at Intervention 2013), and after packing up the single room-with-kitchen-privileges that had been my home in LA, spent the night on two inches of eggshell padding. To understand how the Coast Starlight is set up, you have to know a bit about the history of sleeper travel. Although sleeper cars bring up images of Yuri and Lara escaping Kamorovsky, or all those people joining up to Murder on the Orient Express, the actual sleeper car is an American invention. Think Pullman Porters. People have of course been sleeping on trains since there were trains, but after the first differentiated “sleeper car” was built in 1857, the formal concept of sleeper travel developed and then spread to Europe and Asia. Over 150 years later, there are plenty of long-haul train trips that include sleeping accommodations — Amtrak’ll give you a basic roomette on nearly all of its cross-country rides, and I took a particularly memorable 24-hour sleeper train from Delhi to Amritsar — but very few trains that still offer what was once the classic sleeper car experience. Yes, the Orient Express still runs, as do a number of luxury sleepers in Europe. If you’re in America, the Coast Starlight is your only option. Sleeper cars as luxury vehicles, even at $381.50 per person, are no longer a popular option for either train companies or their passengers, as travelers prefer to spend their vacation dollars on hotels, not to mention trips that don’t take 35 hours to travel between cities. Amtrak’s Coast Starlight, which it bills as “A Grand West Coast Train Adventure,” is its last remaining full-service sleeper train. The Coast Starlight is home to what would have previously been standard: a dining car, an observation car with floor-to ceiling windows, a movie theater, and a full slate of entertainment options, including the two complimentary wine tastings. The majority of these entertainment options took place in the Pacific Parlour Car, “one of Amtrak’s most prized assets.” This car, originally developed in the 1950s for Amtrak’s El Capitan route between Los Angeles and Chicago, is now used only in Coast Starlight runs, and is a warm, wood-paneled lounge that includes armchair, sofa, and table seating. It is also home to a full bar and a library. It’s the type of car that people think of when they call to mind some vague romanticized notion of train travel, but one that few people get to experience. Without knowing it, Mike and I found ourselves in the middle of a literal piece of history – our Pacific Parlour Car and its five siblings have been transporting people out of Los Angeles for nearly 60 years. We hadn’t understood, when we booked the train, that it was so significant. I didn’t know until these very words that it was one-of-a-kind. For some reason I thought that sleeper travel still, for the most part, existed somewhere; that the type of service provided on our trip was the norm and not an economical anomaly. The Pacific Parlour Car. Photo by Califrayray. CC BY-ND 2.0. Upon arrival, Mike and I were personally welcomed by name and guided to our Superliner Roomette. We had just enough space for two narrow bunkbeds, the bottom of which was conveniently folded into two seats. There was no room to stand and close the door simultaneously. There were, however, fresh bottles of water, several welcome guides, and a schedule of the trip’s meals and activities. We spent very little time in our roomette, as was no doubt intended, and instead made our way to the upper deck to get to know the train and its layout. Amtrak’s website had prepared us for the Parlour Car, but it was the observation car that made me gasp – floor-to ceiling windows set against chrome fixtures and Amtrak-blue upholstery. Wide seats, alone and in pairs, inviting travelers to sit and watch as the train took us up the coast, scenery slowly changing from deserts to hills to forests. The observation car, which also runs on the Texas Eagle, the California Zepyhr, and the Southwest Chief, was my favorite part of the sleeper train by far – except, of course, my traveling companion. The observation car. Photo by Nicole Dieker. It was Mike’s birthday, and I had adopted him a sea otter. (Technically, it was a “symbolic adoption” from the World Wildlife Foundation, as no organization is going to give an actual otter to a random person with a credit card.) The gift came with a sea otter plushie, who quickly became our trip’s mascot. After all, we were taking him home too. Mike and the otter in the Pacific Parlour Car. Photo by Michael Bain. However, Amtrak’s WiFi performed much more poorly than advertised. Turns out the entire sleeper car wireless came from a single MiFi hotspot behind the Parlour Car bar. I wrote five articles between Los Angeles and San Francisco, and then the MiFi signal went down, never to fully return. There is a functional movie theater underneath the Parlour Car, with rows of tiny wooden seats stacked in front of an arm-width sized screen. On our trip, Amtrak screened two films: Toy Story 3 and 42. Mike and I elected to pass on the movies, the better to spend the time enjoying the scenery and the company. Nearly all of the other passengers were ready to talk, especially after it became clear that the internet wasn’t coming back. The majority of the other travelers were using the Coast Starlight as a starting point for further travel, such as hiking in Glacier National Park or transferring to an Alaskan cruise. 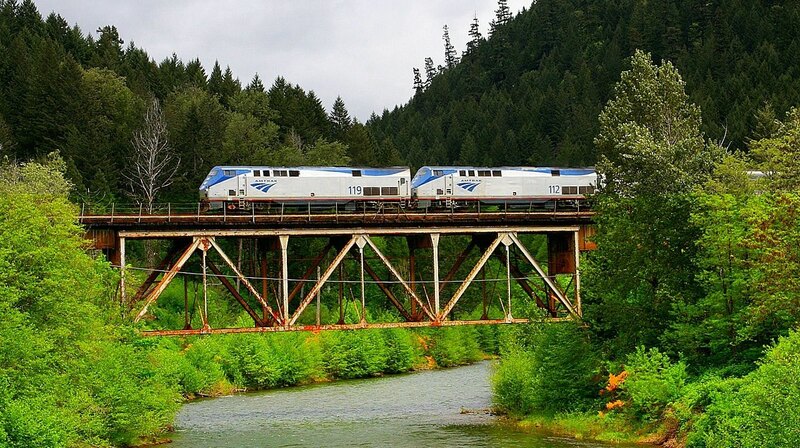 (The Coast Starlight officially ends in Seattle; if you book your Coast Starlight ticket through to British Columbia, you’ll make the last leg via bus.) As we had imagined, though not fully realized, it was a car full of adventurers. The first of our daily wine and cheese tastings came out. Amtrak specifically works with local wine and cheese vendors, and on the way up we enjoyed a Rogue Creamery Lavender Cheddar and a Rabbit Ridge Zinfandel, among others. Mike and I squeezed into a booth with another couple traveling to Portland to do some hiking. We swapped stories about national parks and rock climbing, and, as we did with nearly everyone we met on the trip, commented wryly on the various “luxuries” of life changes and non-traditional career paths that had brought us to the Amtrak Pacific Parlour Car. To take a 35-hour train, after all, you have to have the freedom to disappear from the business world during the work week. There were many people on that train who were retired, either by choice or by circumstance, and others who were doing contract and sporadic jobs that wouldn’t have existed when the Parlour Car first started its daily run. Though it was clear that several of us were still trying to get work done alongside the essentially non-functional MiFi, it was also clear that none of us were quite so important that we couldn’t be missed, turned out like lights against the blinking world of connectivity as the train exited cell phone range and turned off from the coastline into the mountains. When the train started curving around the Northern California hills, the first passengers started to notice the two additional cars we had picked up along the route. We all stopped to stare out the windows, watching for glimpses of these two private cars that clearly belonged to some very special individuals. Were they movie stars? Tech moguls? Eccentrics? What type of person had enough cash to own or rent two private train cars, and what would that person be doing traveling up the coastline? These two cars were from Patrick Henry Creative Promotions, and when we took a brief station stop, we jumped on our phones to learn that the cars cost $9,000 per day. Clearly someone wanted very much to have a private trip, even though the Coast Starlight’s largest roomettes, with personal bathrooms and sitting space, only cost $961 — and a few, on this trip, were sitting empty. The going bet was that it was Bill Gates, though none of us really believed it was. Mike and I dressed for dinner, to the delight of our fellow passengers. I’d like to think that this custom was once a fixture of the Coast Starlight and sleeper travel, and that at some point a century ago there were porters going up and down the hallways with freshly-pressed shirts. However, that may be as romanticized a notion as anything else. After all, Amtrak’s Coast Starlight only goes back to 1971, which places us in the world of The Wonder Years, not Downton Abbey. As it turns out, there are functionally-effective blackout curtains as part of each Superliner Roomette. These curtains cover the roomette’s glass doors by fastening to high-quality Velcro strips around the edges of the doorframe. Here’s how you would have taken a bath on a sleeper train in 1860: carefully, with a basin of water and a sponge. That is, if you bathed at all. Trains were still using toilets that evacuated directly over the tracks until the 1980s, and Amtrak ran these “direct-dump toilets” on its sleeper cars until at least 1989. Now, of course, the Coast Starlight has fully-equipped toilet and shower facilities, with stacks of fresh towels and wrapped bars of soap waiting for you. The shower is on a timer, meaning that every time you push the button, you get just enough water to rinse off between suds. It’s better if you realize this before you start the process; I pushed the button six or seven times trying to figure out why the water wouldn’t stay on. The promise that the MiFi was back on drew several of us up to the Parlour Car; after all, we were just outside San Jose, home of all the internet in the world. If there’s any place we should have gotten a signal, it was here; and yet only a few of us could actually connect. Phones were working once again, though, and we eagerly checked in with friends and family. For all the debate about shushers and anti-shushers and whether smartphones take us “out of the moment,” this much is clear: we were in a beautiful car, after an elegant meal, next to a bartender ready to hand out bourbon and ginger at request – and nearly all the passengers chose to log on and send notes to people we cared about, and learn about their days. Nobody had to say “how come the people on your phone are more important than the person at the table next to you,” just like nobody had to ask, 100 years ago, why someone was penning a letter after dinner instead of talking to a newly-met stranger. We all, already, knew why. Regardless of any personal sleeping preferences, everyone went to bed around 11 or midnight. Amtrak blasts station stops and other announcements at least every 30 minutes, and had promised only a brief window of loudspeaker-free travel. We had until 7 a.m.
Mike and I kept thinking we would sleep in the same bunk until the very minute when we had to do it. So I shimmied into the upper berth, which gave me enough room to lie down but not enough to sit up. There were straps to prevent me from falling out, which actually became an issue as the train pushed its way out of California, swaying so hard that I got tossed from one side of the bed to the other. The otter says goodbye to California. Photo by Michael Bain. The announcements started again at 7 a.m., as promised. Overnight, we had gone from the last vestiges of California desert to full-on Oregon forests. Breakfast was French toast and sausage in the Dining Car, and then I went immediately to the Observation Car to watch the scenery. At this point even the people who had hoped to get work done on the train had given up, and we were all cheerfully accepting that this day would be a holiday. Mike and I sat in the Parlour Car and talked to a couple of Australians who had boarded in Northern California, as well as a family heading towards Seattle’s Penny Arcade Expo. We browsed the newspapers that had been delivered overnight, poked around on Kindles, and enjoyed the complimentary coffee service. We could have had complimentary Champagne delivered to our roomette. In all the excitement of the trip, we forgot to order it. Lunch was with two native Portlanders: siblings traveling home before graduate school started. One worked in art installations; the other in gender theory. Mike and I are in our 30s, but suddenly we were the older, wiser pair, offering advice on careers and life choices. There had been occasional “fresh air breaks” at various stations, in part to keep the trains running on schedule and in part to give smokers a chance to catch up, but we got an actual tourist break in Portland, with nearly an hour to wander the neighborhood around the city. We got coffee. Of course we got coffee. And yes, it was Stumptown. Then it was back to the station, past the large eye sculpture with its own ADA-accessible ramp, and all the little plaques telling the story of the Green Man. Just a few hours left to go. By now the only people left were the people traveling to Seattle, and we were all in excited good spirits. Fittingly, they brought out the second round of wine and cheese, and poured liberally. This time we enjoyed a Flagship Marco Polo Black Cheddar and a Firesteed Pinot Gris, but the real star of the show was the Chateau Ste. Michelle Riesling from Columbia Valley, Washington. Mike and I wanted to buy a bottle, but they sold out before we got a chance. We took the latest dinner seating we could, and still it seemed too early. With a thoroughly hearty breakfast, lunch, and wine tasting under our belts, not to mention the lack of general physical activity, nobody was particularly hungry for the second formal dinner in the Dining Car. This was fine, since the choices were the same as the previous night and slightly worse for wear. We skipped salad, skipped rolls, and skipped dessert, and talked to our dining companions again about the economy and careers and life and all of the other things you talk about when someone asks how you came to be on a 35-hour train. Our dining partners, this time the older and wiser couple, said Mike and I looked so good together. They had seen Mike unwrap his otter, at the very beginning of the trip, when we didn’t realize anyone was watching. The Coast Starlight was a lot like that cruise – instant friendships with adventurers and people chasing unusual dreams, near-lack of connection to the outside world, continuous food and wine and entertainment, the illusion of luxury, the connection to a type of travel that was over decades ago and is as romanticized as it is real. That cruise was also a liminal space for us, as was this train; a far faster way for us to get from one place to the next than we could have otherwise. We sat together on the lower bunk, otter between us, bags packed up and ready to go, knowing this had been by far the right choice. “Take a picture,” I said, as we pulled into Seattle’s King Street Station. Arrival in Seattle. Photo by Michael Bain. “We totally have these Great Big Beautiful Tomorrow looks on our faces,” I replied. As a threshold separating one part of life from another, the Amtrak Coast Starlight works considerably well. As a piece of history, it is an unexpected delight. Whether or not you think it’s an adventure depends on the type of person you are when you board the train. I think you know what we decided.